* Different Z Dimension available (Z=8,5; Z=15, Z=20). * Converter: 10µL=0.01ml, 20µL=0.02ml, 50µL=0.05ml, 100µL=0.1ml, 1000µL=1ml, 3500µL=3.5ml. * White Wall also available. * With STOPPER also available. What does Z height mean? Z Height/Dimension is defined as the distance from the bottom of the cell compartment in your instrument to the center of the light beam. Why Z Height/Dimension is Important? Each instrument manufacturer makes engineering decisions for the design of their instrument to assure that it performs optimally. The height, width, focus and placement of the light beam in any instrument is based on the engineering decisions to assure that the instrument performs to their published specifications. It is important to you, as the instrument user, only when you are attempting to use a small sample volume. You must assure that your smaller volume is placed in the centre of the light beam and that any light which does not pass through your sample is blocked (or masked) by blocked (or masked) by black material. If the cell is not properly masked then the sensitivity will be eroded. How can I determine the Z Height of my instrument? 1) Cut a piece of dense paper 12mm wide and 100mm long. 2) Make a hole in the centre of the paper about 3mm in diameter (just push a ballpoint pen through the paper) 8.5mm from the bottom of one end and 15mm from the bottom of the other. 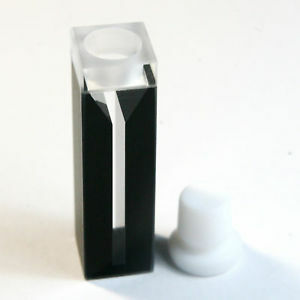 **All Cuvettes Are Supplied with MATCHED PAIR CERTIFICATE, in Plastic Gift Box. If you have any specific requirement please contact us.